I’ve been getting some requests for photos of our new place in Colorado so I thought I’d spend a post showing off the new digs. Before I get into the specifics of the house, there’s something very important that you need to know: I had practically nothing to do with the interior decorating. I hung a few things (poorly) and drank beer while Betsy and her Mother (Hi Mary!) set up pretty much everything. So, if you see something cute or lovely, it’s almost certainly not anything I can take credit for. But as you can see from the outside, it’s a very cute house. With a yard! It’s definitely a change for us to go from a two bedroom 3rd floor apartment to an actual house. 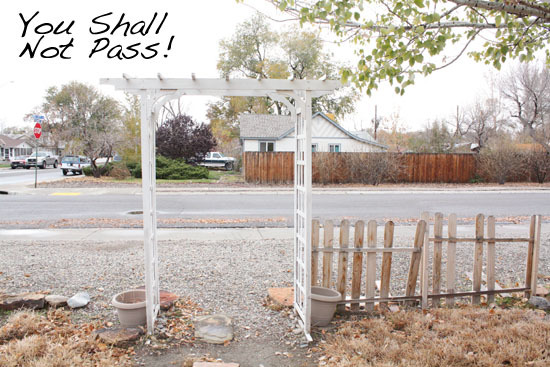 I think this is maybe the funniest and saddest thing I’ve ever seen, but there’s this completely run down arch in our yard with like ten fence posts attached. See those fence posts? That’s the entire fence. At first I didn’t like the arch, but now I’m completely in love with it just because I have no idea why it exists. 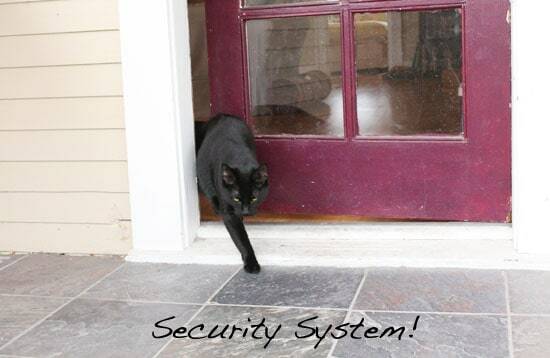 Anyway, that’s not our real security system obviously. 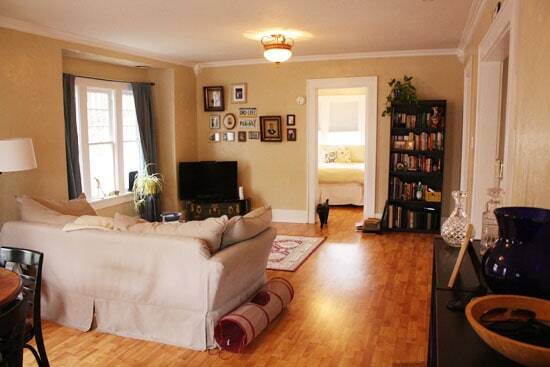 Once you get past the intense security, our quaint little home has a nice, fairly open layout which we like a lot. Again, props to Betsy and Mary on the decorating. 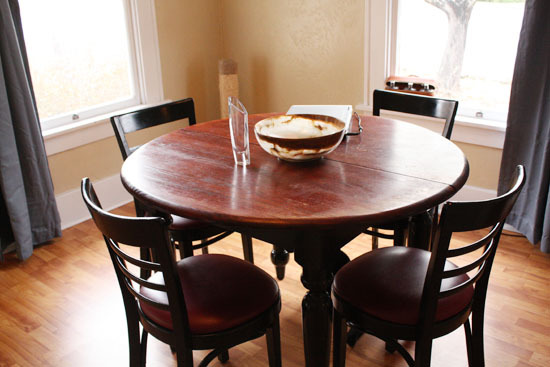 Betsy and I spend a lot of time in the living room at this nice round table that we bought from her old roommate. He was quite handy and re-finished it and painted all the chairs to match. 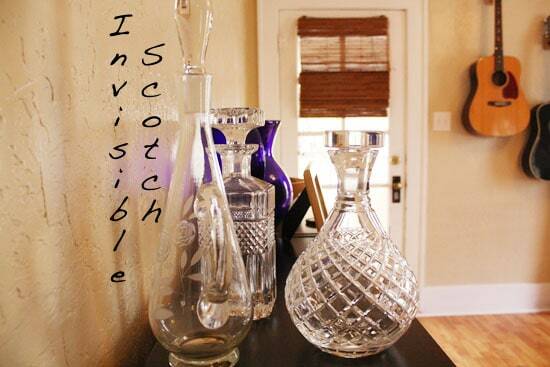 Some of my favorite little decorations in the living room are these old crystal decanters that Betsy’s Mom gave us. Some day I’ll fill them with delicious dark beverages. Once you get past the living room, there’s my office! 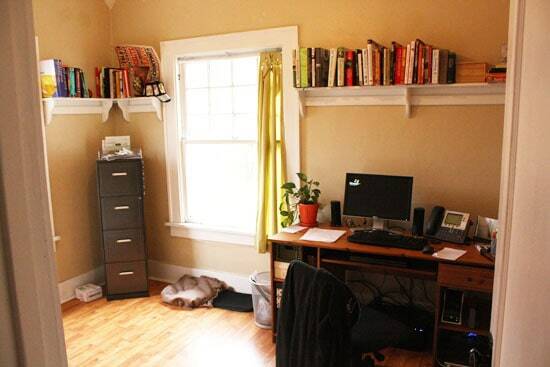 I’m actually working from home here so it was important for me to have a nice office with some natural light and lots of cookbook space obviously. And our bedroom which is wonderfully surrounded by windows. I’m already in love with our bedroom though. Very cozy and comfortable. Next, to the kitchen we have this strange little add-on room that we didn’t quite know what to do with. So we (Betsy) stuck a small table and chairs there and we call it The Breakfast Nook even though we never eat breakfast there. What actually happens in The Breakfast Nook is photography. See all those windows? It’s like photography gold. As you might guess, this is my favorite part of the house without a doubt. It has marble counters (So maybe I can make croissants n0w), a deep sink, a dishwasher, a gigantic fridge, and lots of counter and cabinet space. It has a really nice gas stove that’s a huge improvement on our old one mainly because you can actually USE all the features on it (broiler, timer, etc.) Definitely not true for our old stove. 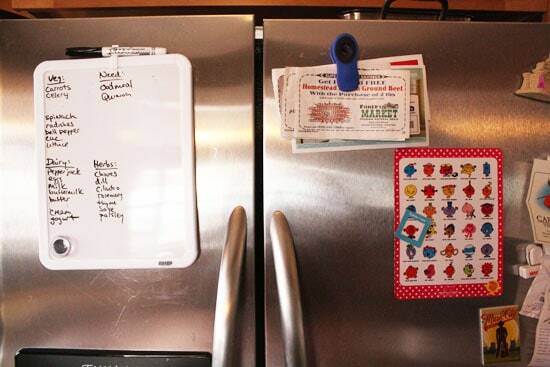 I’m on a new mission since the move to be way better about keeping track of produce and food in the fridge so I’m working out a system of what’s in the fridge and what I need and listing it all on a whiteboard. If I ever figure out a system that works nicely, I’ll do a post on it. Also, we have a magnetic emotions board that I frequently use to remind myself how I feel that day. On this day I was apparently feeling NOISY. So that’s really the highlights of the house! There’s a basement as well, but nothing really interesting is down there unless you consider washers and driers to be fascinating. In short though, we’re really happy here so far and I don’t see why it won’t only improve as we make friends with a few locals and start exploring the area more! Tomorrow, we’re going back to the regularly scheduled program of Thanksgiving dishes. Namely, POTATOES. Cozy and comfortable. Great decorating! Looks like "home!" Wow Nick, it's a real nice place! Tipsy is adorable and look so at home already!!! Great house! I'm jealous of all that light!! Love the new house!!! Betsy and her mom did a great job decorating! What an upgrade from DC living! Looks great! 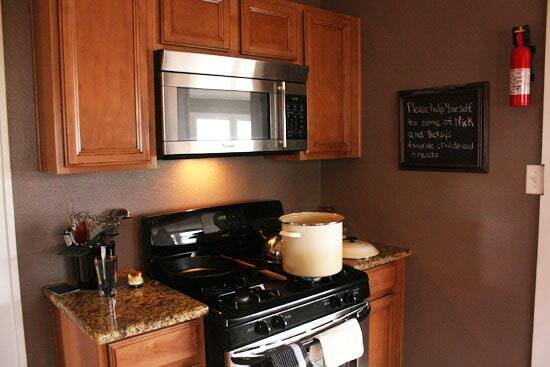 So jealous of those countertops!! Congrats! Very nice! 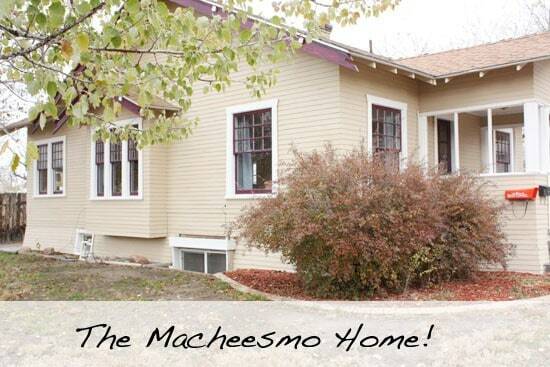 A wonderful new home for Macheesmo. Congratulations! 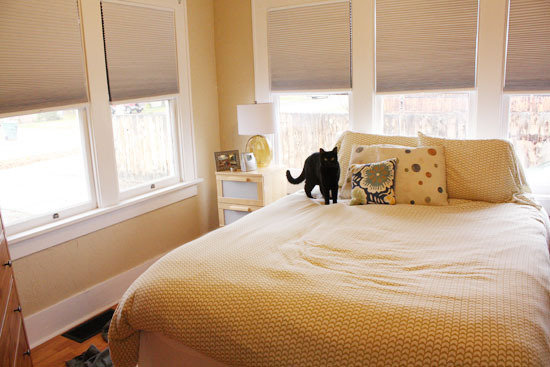 I love it and love the bedroom! Thanks for posting. Can't wait to visit! Congratulations on your new house. Looks perfect to start a wonderful marriage. You, like me, whenever it comes to decorating it's always "yes dear" is this how you want it"? Best of luck in your new home and marriage. Looks like good beginnings. Your new home is beautiful, Nick. Congratulations! 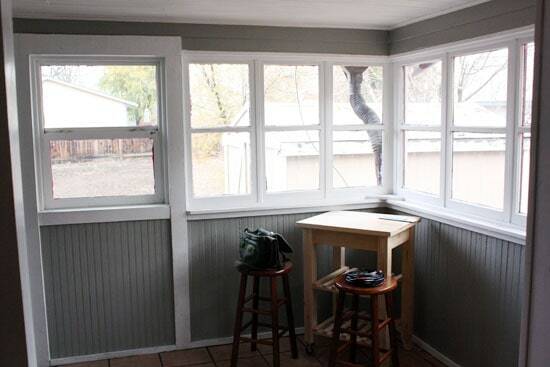 I'll bet your "breakfast nook" was exactly that at one time, complete with built in benches. Nick. Oh my goodness. You tell Betsy (and Mary) they did a great job – and I also love the bones of the house, too. Super cute. Congratulations, you two newlyweds! Looks so cozy! Congrats on the new digs! It looks great, Nick! :) Makes me want to come visit! Now that is a kitchen were magic can happen! Congrats! Speaking of booze, have you ever made any home made infused vodka? I am considering making a cranberry/orange infused vodka as X-mas gifts this year (obviously only to a select crowd whom will appreciate it). Thanks! Congrats. Looks like a very cute house. 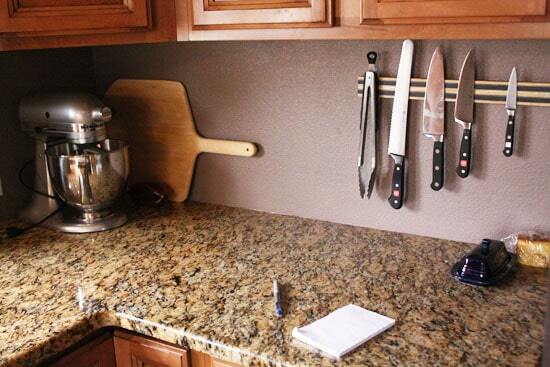 I noticed the magnet bar you have in the kitchen with all your knives. Should I chuck my wood block and magnetize????? It's been on my list FOREVER. I'm going to do it soon though. Double promise. I have some good ideas for it. very nice nick and a whole lot brighter! love the hardwood floors. that was a huge must for us. well, that and a pool. 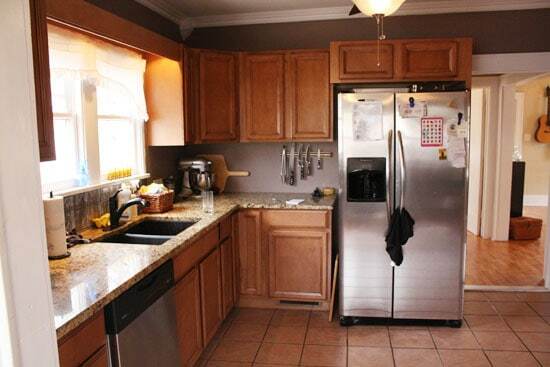 that one kitchen photo reminds me i need a kitchen aid mixer, still…. did you see my pumpkin pop tarts? you seriously need to make these man. they were killer good. !!!!!!!!!!!!!!!!!!!! it's so nice!!!!!!!!!!!!!!!!! i miss you guys. I love your house. I am going to come visit soon. Ditto. The house is beautiful! If you have a pullout couch, we'll stop by on our cross-country moving to DC trip next summer. I've always dreamed of living in Colorado (weird, I know), but I've never been to the state! How does Tipsy feel about dogs? Thanks Nick, for sharing you all's new HOME w/ us……Love Colorado from visiting family in Denver years ago..Many thoughts and prayers have gone up for you and Betsy as you begin a wonderful long and 'mostly' Happy Life together!!!! I must add an " Eeyore" comment to your wonderful happy wife statement: Grumpy Husband……S****y LIFE!